"Gymnast II," a male figure of a gymnast standing on his hands. 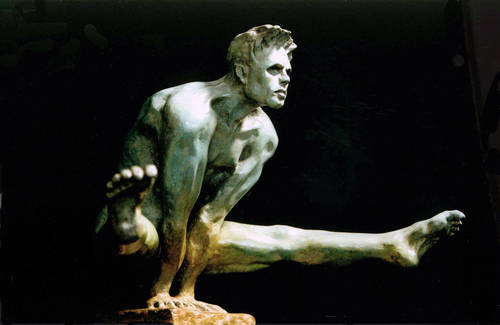 It is a variation on my first major bronze, "Gymnast I," for which only one piece was cast. Gymnast II is currently (2008) at 4/10 in the edition and comes in a variety and variation of pure black, chestnut, apple green and burnt red patinas.